Born and raised in Las Vegas, NV, Dr. Heeyup Ghim delivers comprehensive dentistry for families in Henderson and surrounding areas. Dr. Ghim attended Bonanza High School and received his BS in biology from UNLV, where he was a member of the National Honor Society. He earned his DMD from Boston University Dental School and entered private practice in 2005. The doctor is a member of the Southern Nevada Dental Society, Nevada Dental Association, American Dental Association, and Henderson Chamber of Commerce. He regularly attends continuing education courses focused on all facets of dentistry, including cosmetic treatments, children’s dentistry, restorative therapies, and implant dentistry – including All-on-4 dental implants. 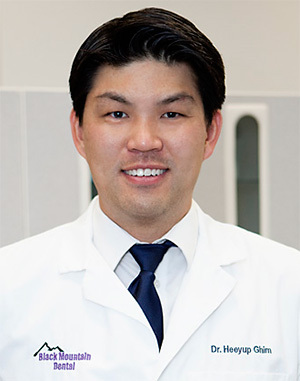 When not treating generations of families at Black Mountain Dental, Dr. Ghim enjoys skiing, snowboarding, tennis, mountain biking, and cooking.